See the tiny dot in the center of the photo above? 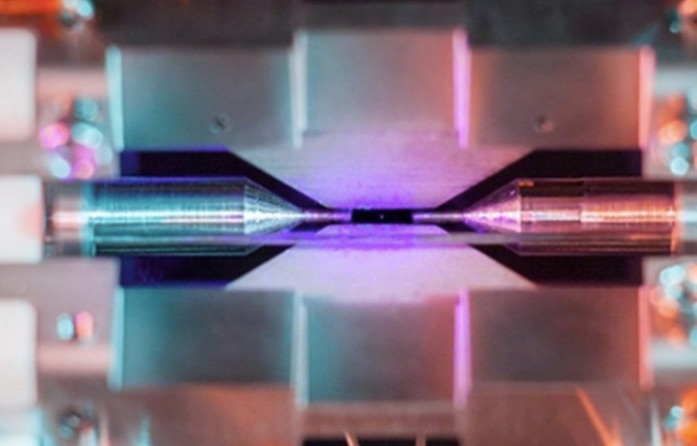 That's a single strontium atom, visible to the naked eye. University of Oxford quantum physicist David Nadlinger's photo (full image below) won this year's Engineering and Physical Sciences Research Council's scientific photography competition. 'Single Atom in an Ion Trap’, by David Nadlinger, from the University of Oxford, shows the atom held by the fields emanating from the metal electrodes surrounding it. The distance between the small needle tips is about two millimetres. When illuminated by a laser of the right blue-violet colour the atom absorbs and re-emits light particles sufficiently quickly for an ordinary camera to capture it in a long exposure photograph. The winning picture was taken through a window of the ultra-high vacuum chamber that houses the ion trap. Laser-cooled atomic ions provide a pristine platform for exploring and harnessing the unique properties of quantum physics. They can serve as extremely accurate clocks and sensors or, as explored by the UK Networked Quantum Information Technologies Hub, as building blocks for future quantum computers, which could tackle problems that stymie even today’s largest supercomputers.